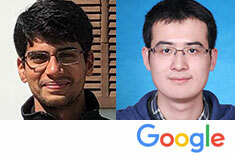 The School of Computing would like to congratulate Chinmay Kulkarni and Zhuoyue Zhao, recipients of the 2019 Google PhD Fellowship. These awards are presented to exemplary PhD students in computer science and related disciplines. We have given these students unique fellowships to acknowledge their contributions to their areas of specialty and provide funding for their education and research. We look forward to working closely with them as they continue to become leaders in their respective fields. Chinmay Kulkarni, has been awarded the 2019 Google Fellowship in Systems and Networking. Zhuoyue Zhao, has been awarded the 2019 Google Fellowship in Structured Data and Database Management.